The Tuscan rose is a large, light and spacious suite on the main level of the house. 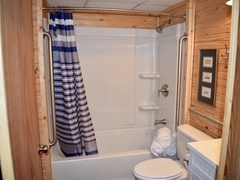 It features cathedral ceilings, a nice deck view, a comfy king size bed and matching queen bed, satellite TV and a private bath ( check out the round corner shower ). This is one of our most popular rooms. The decor could be called "African Tropical", with color coordination matching the colors of the Tuscan Rose. French Doors lead into this lofted spacious Room finished in aged Pecky Cypress walls and ceiling. The Starlight Rose features a vaulted floor to ceiling window wall with a private walkout balcony and romantic sitting area looking over the front garden. It walks over the main gathering room through the reading and writing loft to a rear covered sitting porch with a view of the woods behind the house, the extensive decks and the pool area. This Queen-size room boasts room to spread out, with a seating area, large private bath, and a soft feminine nautical feel.Interior and outside doors allow access to the semi private patio facing down the valley to Grand River's "Little Lake Park". Mini-Frig, Micro-wave and free Wi-Fi add conveniences you love. This spacious King Size room features both interior and outside entrances, granting access to the den and semi-private patio facing the Little Lake and Park. The private bath has a tub/shower. Keep connected with our free Wi-Fi and TV. Or un-hook in this charming hide away. 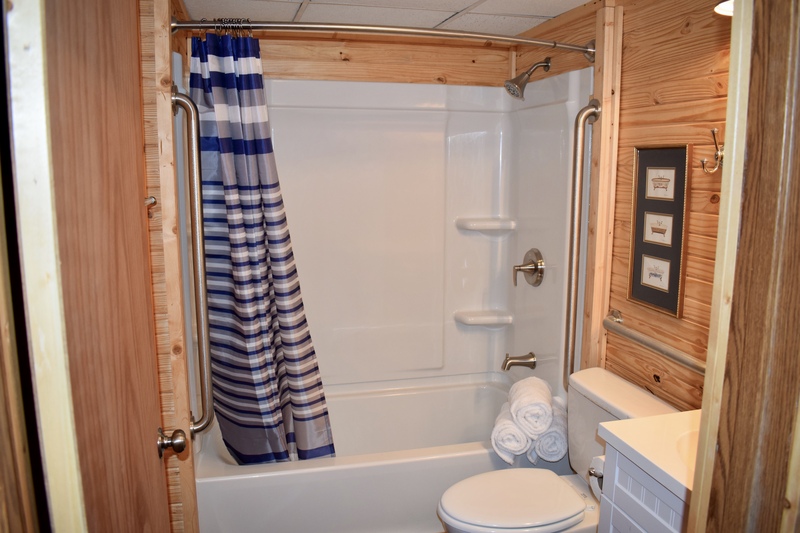 Rainbow's End Pool Cottage - A quaint two-bedroom, one bath cottage with fully equipped kitchen and large great room which includes 2 - 4 top dining tables. Amenities include a washer & dryer and the cozy covered front porch all located poolside. This cottage has 2 sleeper couches in the living room. 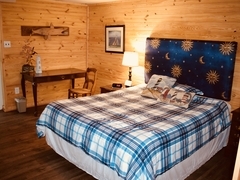 Rates: $225 per night for up to 8 people - $12.50 extra for each adult person and $6.25 extra for children under age 12. Weekly: 6 nights at $1200 for up to 6 people. Cancellations must be made 14 days prior to the reservation date in order to incur no charge. Cancellation between 14 days and 3 days (72 hours) prior to check in time will incur a charge equal to 25% of the room rate. Cancellations between 3 days (72 hours) and 2 days (48 hours) prior to check in time will incur a charge of 50% of the room rate. Cancellations between 2 days (48 hours) and 1 day (24 hours) prior to check in time will incur a charge of 75% of the room rate. Cancellations made within 24 hours of check in time will incur a charge of 100% of room rate. For group reservations of 10 or more people; in addition to the above cancellation policies, we charge a deposit equal to 25% of the total bill for the reservation at the time the reservation is made. This deposit is refundable if the reservation is cancelled prior to 30 days before the reservation. If the reservation is cancelled between 30 days and 14 days prior to the reservation, this 25% deposit is non-refundable. Visit our recreated historical log cabin village tucked into the natural beauty of Western Kentucky. Fantastic dining, beautiful gardens, unique gift shops, winding streams, miniature golf, and gold panning. Variety! Shows at the Badgett Theatre in Grand Rivers rival anything you can find in Branson or Nashville. High-calibre talent, music and performances right here in West Kentucky! Whether you are looking for an evening out with friends, or planning the perfect Vacation at Kentucky Lake, the Grand Rivers website is full of helpful information. KentuckyLake.com is designed to help you plan your Kentucky vacations, relocation or just a weekend getaway. 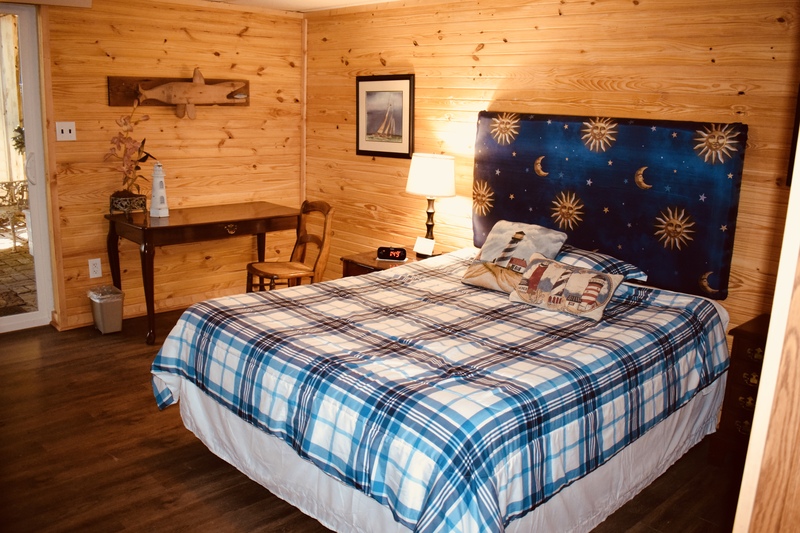 All information on Kentucky Lake, Lake Barkley and Land Between the Lakes lodging, dining and activities are listed inside. Get in touch with us--we'd love to hear from you!